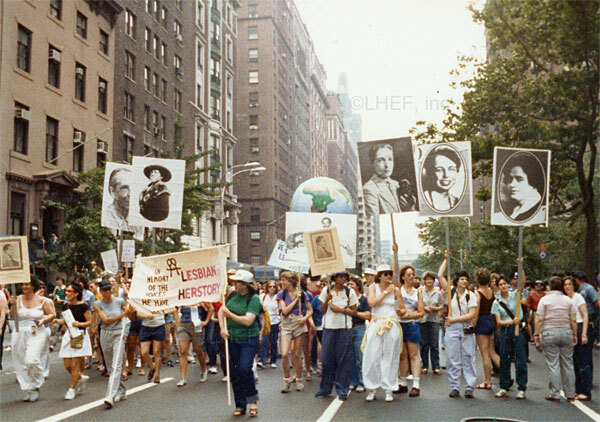 The Lesbian Herstory Archives is home to the largest collections of materials about lesbians in the world. Our photo collection, which we are now starting to digitize, reflects the growth of the Archives since 1974. Our collection holds tens of thousands of images. We offer you a small sampler here. Please keep in mind that many items came to us from women who simply wanted their images saved, their lives remembered. The collection holds snapshots, professional photography, found images and everything in between. When we first started our collection the focus was preservation and collection, now new technology offers us the possibility to include access to the collection from remote places as well. We have started the process and these pages are a sampler of the collection we have at the archives. You’ll see we have added the information available to us where possible. We don’t always know a lot, often the name of the photographer is not known, often an exact date could not be determined, so if there is any additional information you can offer on any of the materials, contact us via email at imageslha@gmail.com. For any use, whether to blog, to put on another site, or any publication needs, please contact us at the same email address. These images are not public domain and we’d like to make sure all copyright issues are cleared before any further publication happens. Enjoy this sampling!